Everyone expect extra care and tenderness from their loved ones and a love filled thank you would bring lots of happiness on their everyday living. Some romantic wards of gratitude can make the foundation of your relationship more affectionate and able to bound your partner have some extra time for you. All you need just few simple and sweet words to reach their heart which are enough to go a long way. 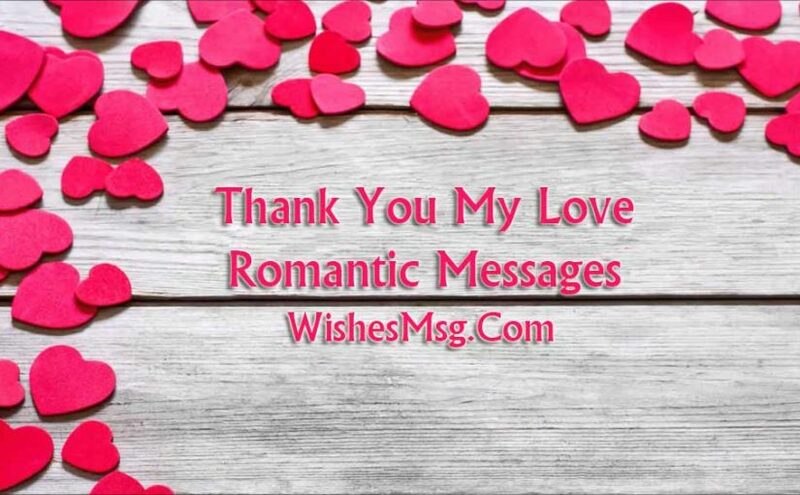 Here WishesMsg.com presenting Thank you My Love Messages collections to thank your partner, lover, husband, wife, girlfriend or boyfriend for all the love you got. 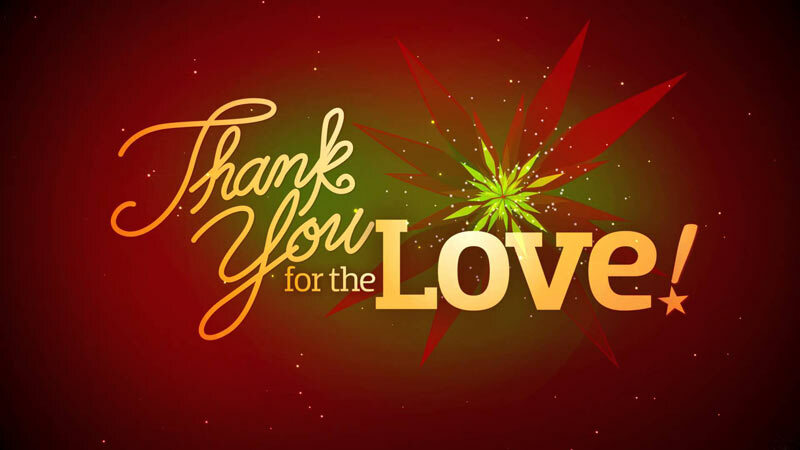 Express the gratitude feelings of your heart with a sweet romantic way and inform your partner that your heart skip a beat when you think about to be loved. I want to hold your hand, laugh at your jokes, walk by your side, snuggle on the couch, look into your eyes, talk about whatever and kiss your lips, every single day. Thank you for staying There! Your love is the doctor to my wounds, friend to my sorrows, mentor to my dilemmas, teacher to my actions and companion to my joys. Thanks. To talk about you unconditional love, to express my gratitude towards your care, to show how I feel to have been loved, I am just as clueless. But thank you is all I can say. My love for you is hotter than Hell because you have made my life more beautiful than Heaven. Thanks darling. Thank you for taking situations that I come to you all frazzled and worked up about, and laying them out for me in this wonderful, logical, guy way that makes everything more clear. If I were a cell phone, you would be the charger. I would be dead without you. Thank you for being the charger of my life, I love you. You hold a special place in my heart. You have the key to many areas of my life. I wish I could give you all I have but thank you is all I have to give. Thank you for loving me as I am, you turn every moment of my life were a fairy tale, you make me a better, thank fate for having put you in my path so that you brings joy and happiness to my life. Thank you for your creative touch, it adds more beauty to the world. I’m more thankful for you than you’ll ever know, and I love you more than you could ever imagine. I don’t need a big red heart, a box of chocolates or dozens of roses. Because you, my love, make every day feel like Valentine’s Day. Thanks for making me realize that the elusive dreams of having a beautiful life can actually come true. I love you. I can shout of your love on the mountains. I can hire a thousand orchestras to sing of your care. I will do so much more because you are so special to me. I have had more than enough. I have been loved so much by you. And I wish I could return the favour. Thank you so much for loving me this way. 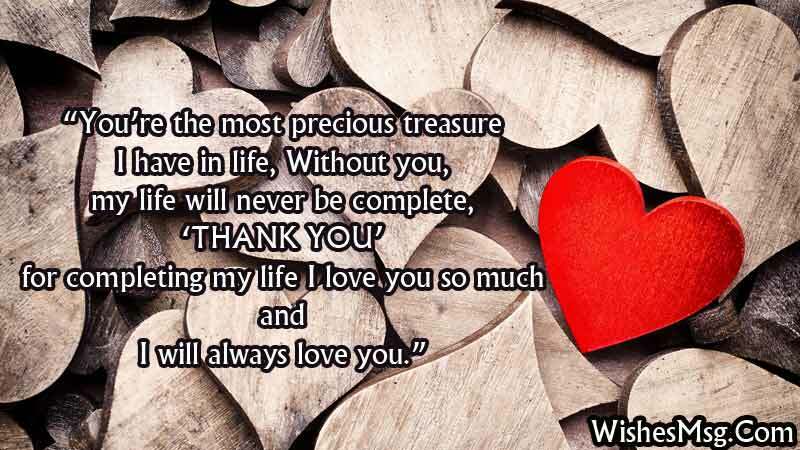 Thank you my heart, thank you for little words of love, which for me are real gifts, and thank you for your generosity, your kindness, the good values ​​that you carry in you, you embellished my life with happiness. Thank you my heart. You may not know this but you’re everything to me. Thank you for being so wonderful also thanks again for being so open and non-judgmental. It makes my life more cheerful. I love you. Thank you for all of the dorky pictures I make you take with me, and then for not complaining when I post them all over social media for every one of your friends to most likely see. Thanks for taking the word WORRY out of my vocabulary and replacing it with HAPPINESS. I love you. This is more than I wished in a lifetime, even more than I hoped and prayed for. You have been the reason I am this happy and great. I wish you well in life, too. Thank you. Thank you for the times you have went out of your way to do something romantic or sentimental because you knew it would mean the world to me. If I would buy a special gift to appreciate your help and support, I would go bankrupt. For all you’ve done for me, thank you is all I can say. My heart beats so fast every time I see your lovely face. I always think of you and miss you when you’re not around. I love you. You’re always there for me, you listen to me when I tell you my worries, you go back me up when I’m sad and tired, you encourage me when I give up, and you consoles me when I suffered a failure. You do all this for me. Thank you very much my love. Thank you also for the times those attempts ended up being more comical than anything for the both of us. The fact that you try is romantic enough, and if I ended the night laughing with you, it was a perfect one regardless. I was blind within and hopelessness got all of me. You came and you saved the day! May God be with you is all I wish for you. I fought, you made up. I argued, you agreed. I cried, you reassured. I loved, you loved me back even more. Thanks. It’s you I see first thing I open my eyes in the morning, It’s you I see last thing as I close my eyes in the evening, And I want to spend my life doing the same thing spending day by day with you. Thanks for let me do so I really love you so much. There are many reasons to be sorrowful but you filled my face with an untold gale. There are so many reasons to give up but you stand as a sure friend. I wish you all the good you ever wish me. And God bless you in return. Life is really not worth living without you! You make me feel so special and complete! 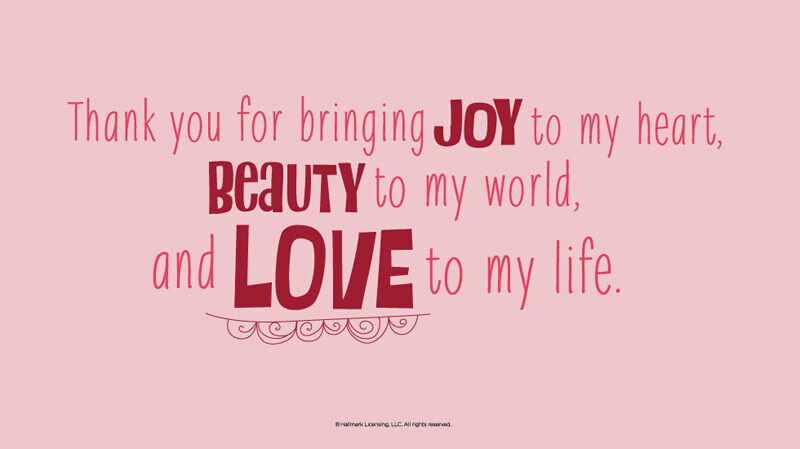 I can’t find words to utter but I just want to say “Thank you and I love you darling! How did you manage to stay together for so long? It’s simple really. We are from a time where if something is broken, we fix it; Not throw it away. Rock solid, unbreakable, unshakable, sturdy – thanks for being the cement that binds our family together. I simply thank God that He made you to be my life partner. Life with you is really amazing. Thank you for being so kind and loving! I really love you! You’re the most precious treasure I have in life, Without you, my life will never be complete, thank you for completing my life I love you so much and I will always love you. Being loved is precious and like blessings even now and then if you are really in a deep relationship with someone special to you. 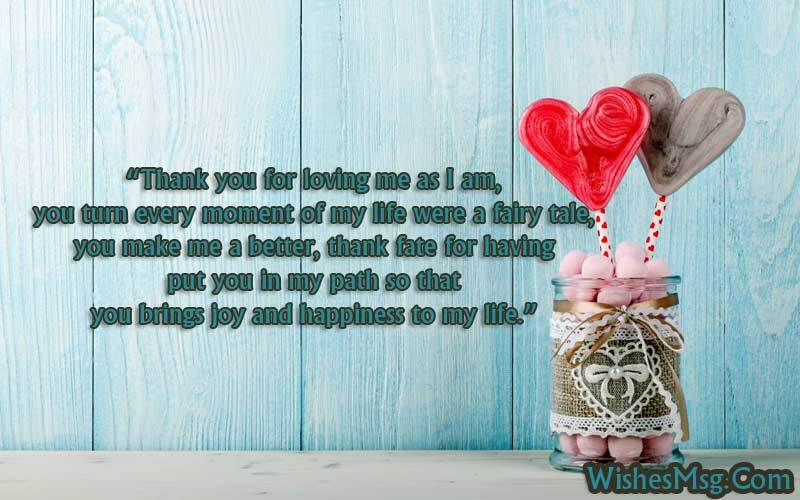 Just leave a sweet thank you note in the wallet of your partner, tag him/her on a Facebook post mentioning special care or send thank you my love messages to bring charming smile on your dear ones face. Your single step can make his/her day more beautiful.